A trio of EQs which keep the sound and spirit of Pultec's designs alive and kicking. Sonically superior to UAD's previous Pultec emulations. MEQ-5 helps creative treatments of mid-range frequencies. HLF-3C is sonically rich and deceptively powerful. Not content with adding new plug-ins to its ever-growing list of modelled hardware, UAD is increasingly turning back to some of its earliest titles. 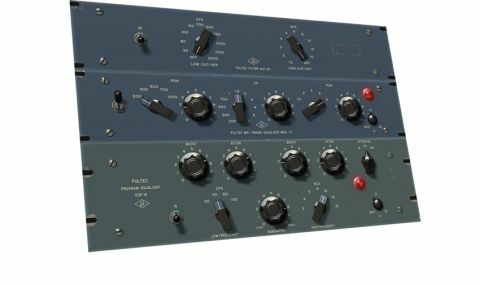 Following the reworked 1176 and LA-2A, the Pultec EQs are the latest for an overhaul. They don't just give a more detailed sonic fingerprint, however; this collection of three titles includes a new design and is available via UAD software Version 7.1. "Pultec EQs feature unusual design elements, making them 'go-to' processors for a range of applications"
The first Pultec EQ, the EQP-1A proved a hit in 1951 as users found their mixes improved by including them in the signal chain. The buzz spread via descriptions such as 'musical', 'warm', 'airy' and 'smooth' and Pultec EQs have remained popular ever since. They also feature unusual design elements, making them 'go-to' processors for a range of applications. The first plug-in within UAD's new collection is a recreation of the EQP-1A and features three-stage tone control. Pultec's original became a talking point as, rather than featuring a single dial to boost or cut volume at your chosen bass frequency, the EQP-1A's separate Boost and Attenuate dials made it possible to apply boost and cut simultaneously. Whether by quirk or design, as volume adjustments were applied at slightly different levels and at adjacent frequencies, this had the potential for incredibly powerful results, the most famous of which are increased clarity, weight or power to kick drums and bass sounds. Further up, mid-range can be boosted with adjustable bandwidth, whilst a separate Treble control allows for Attenuation at 5, 10 or 20kHz. Like the EQP-1A, tube amplification simulation has been taken seriously by UAD through the MEQ-5, a specialist tool for mid-range tone control. It offers three frequency bands but with two of these providing Peak (with variable frequency choices) and the other Cut or Dip. This is a useful parameter set, with musical results often achieved with a little dip around a problem frequency group and subtle boosts either side. The air achieved with a boost around 5kHz is hugely pleasing too. Lastly, a brand new processor completes the set - the rare HLF-3C, which provides twin-band filtering at 12dB per octave. The Low Cutoff offers frequency choices between 50Hz and 2kHz, whilst the High Cutoff drops from 15kHz to 1.5kHz. It's the modelled circuitry which makes the difference here; plenty of DAWs natively provide EQs and dedicated filters which can slope frequencies in this way, but few sound as warm and pleasingly musical.